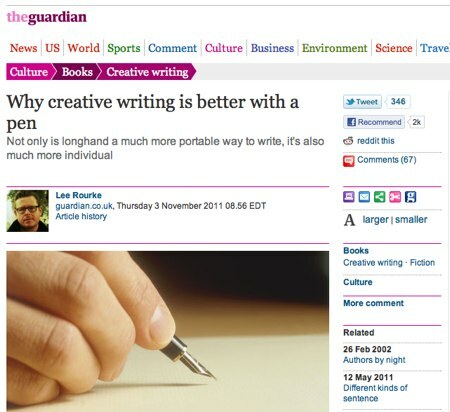 Lee Rourke tells us why creative writing is better with a pen. Surprise: it’s not the smell of paper! Rourke argues for writing with a pen, MOVING beyond the standard stationery fetish, and he’s not alone in his preference. "Pen and paper is always to hand," agrees Jon McGregor. "An idea or phrase can be grabbed and worked at while it's fresh. Writing on the page stays on the page, with its scribbles and rewrites and long arrows suggesting a sentence or paragraph be moved, and can be looked over and reconsidered. Writing on the screen is far more ephemeral – a sentence deleted can't be reconsidered. Also, you know, the internet." The real message should simply be “write.” It doesn’t matter if you dress it up in fancy paper or bang it out on a screen.